After grading the bed and forming the banks it was now time to start the creative, fun part of the process – creating the rock ramp where a redundant weir recently stood at the top of the back channel through Ravensbury Park. 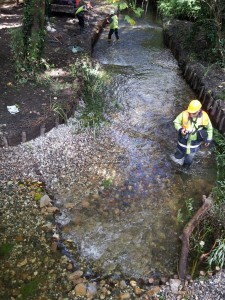 The temporary dam was removed and the river released. Without the weir, energy was returned to the river and the therapeutic sound of water rushing over clean gravels was heard once again. The first time at this site in possibly 50 + years! Then the creative, fun work started. 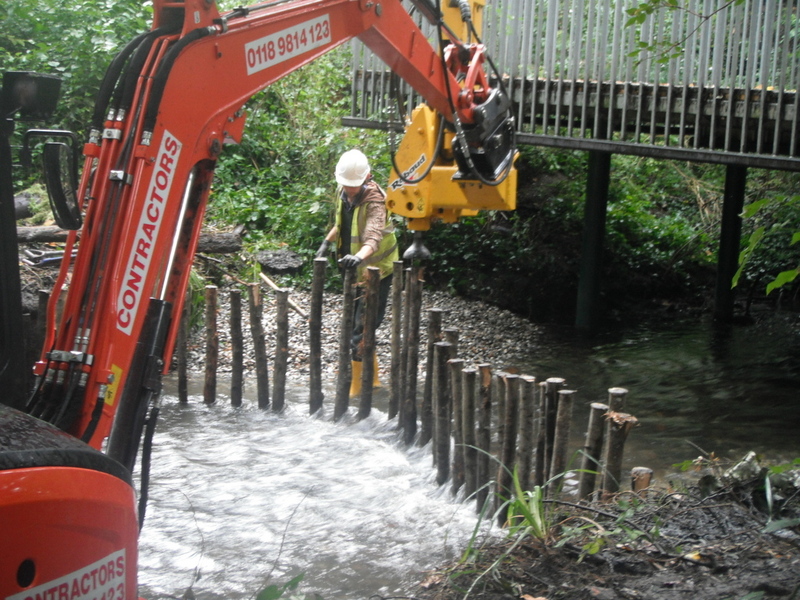 Simon Cain and his crack river restoration team placed 7ft chestnut posts in the river at carefully selected sites to start the process of creating the rock ramps. 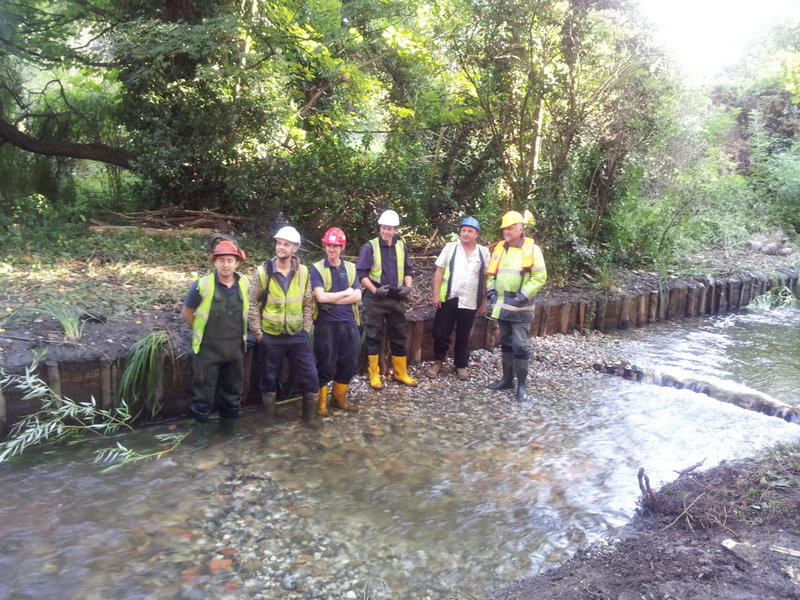 The stakes were pounded in by the expert digger driver, Jimmy – a lot easier than doing it by hand as our Wandle Trust volunteers will agree! Large 75mm cobbles were added around the posts and then smaller 40mm flint gravels added to dress it. These rock ramps are extremely important in attenuating the flows and creating bed stability. 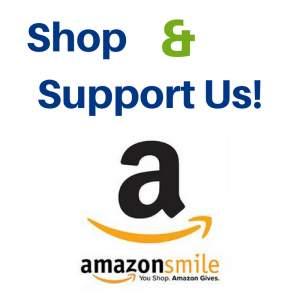 The structures are also extremely durable and will withstand all flow levels. What was once a slow moving ‘ditch’ with silted up gravels, uniform flow and bed soon became a sinuous channel with varying flows, depths, pools and riffles. A joy to behold! I could quite happily have stood and watched the river all day! 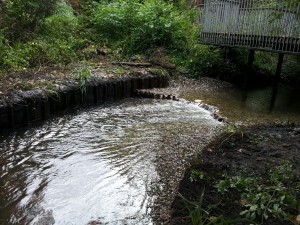 Starwort and some water parsnip cuttings were added to the gravels in strategic places and will provide key habitats for invertebrates and fish once they establish. Over the next year the river and banks will settle, vegetation grow, fish will take up residence or swim happily through with some hopefully even spawning there. 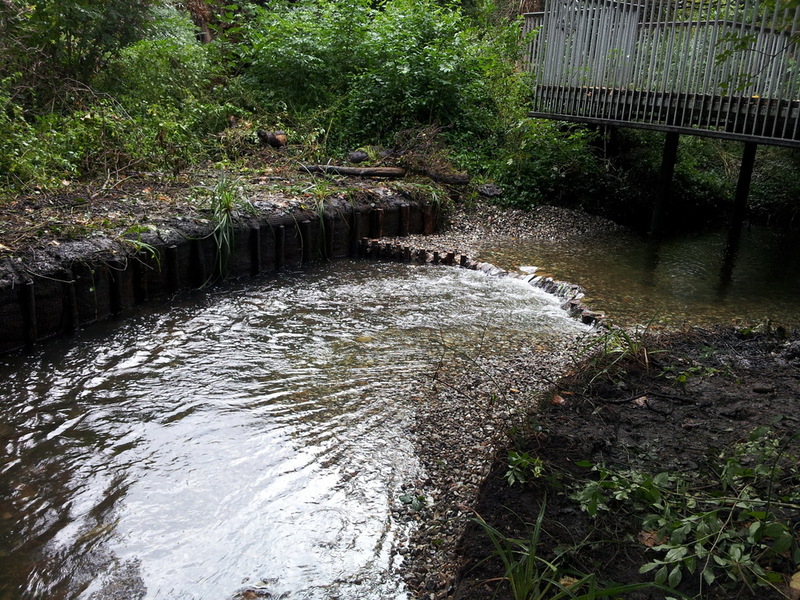 This is another step forward for the Wandle and will help make it and the flora and fauna that live there more sustainable and resilient to the pressures of an urban environment. Its one of the reasons why we love our work. Go and have a look and watch the site develop over the coming seasons – I personally can’t wait! With many thanks to all who helped make this happen, especially to the Cain Bioengineering team of Nick, Max, Chris, Jamie, Jimmy, Simon, Pete and Jake. 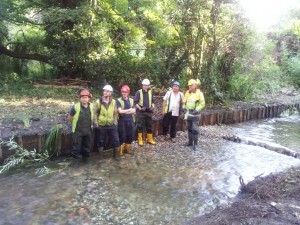 This entry was posted in Uncategorized and tagged River restoration, Wandle on September 27, 2012 by Tim.